Easily attach to your lanyard during a show, clip it on a backpack, purse or stroller. 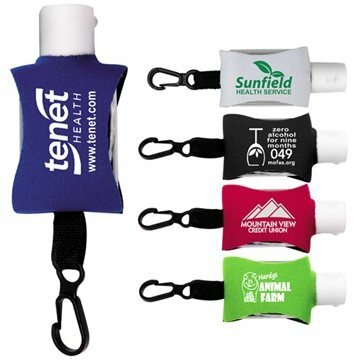 Sleeve holds the 0.5 oz antibacterial gel bottle. Disclaimer: Please Note: Small bubbles and variation in vinyl label application alignment cannot be avoided and is not considered a defect. Clear ingredients label on back will be visible through the front and may make imprint difficult to read. Thin lines and small text are not recommended. Only Ground Freight Available in the Continental USA for Hand Sanitizers. If expedited shipping is requested/required the order must ship Federal Express, and by law. Hand Sanitizers ship air will be required to pay Hazmat charge. Response from design team was excellent & they met/exceeded all of our needs! A real hit; great service; very accomodating. We're pleased with the quality of the item.